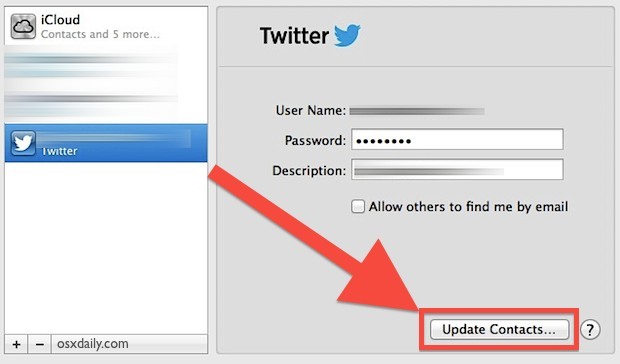 Now that Twitter is deeply integrated into OS X from Mountain Lion onward, you can easily add Twitter usernames and their accompanying profile pictures to your existing Contacts information automatically. This is done by crossmatching data in your Contacts list with Twitter email addresses and phone numbers, which basically guarantees accuracy. If you haven’t done so already, you’ll have to grant Twitter access to your Contacts list before it is allowed to access the data and populate contacts with usernames and images. Of course the updated Contacts will be sent over to your iOS devices too, assuming you have iCloud syncing such information. This nice tip was overlooked in our initial Twitter & OS X setup guide, but if your contacts use Twitter frequently it’s definitely worth following through with. What are the security implications of doing this? Does twitter get all of your contacts? It grants Twitter access to Contacts but you can immediately revoke that access again. If you embedded Twitter into OS X though you are probably already sharing this data! My only problem with this has been a duplicate of contacts whenever someone updates a photo. I don’t understand why the contact’s photo simply isn’t overridden. Who cares for Twiter? It a silly waste of time.